"Making your dog a pleasure to own", is the goal that WOODSTOCK DOG TRAINING SCHOOL, sets itself with every pup and every dog that passes through the portals of its training school. 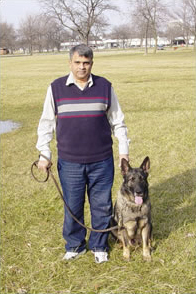 Mr. J.Rangarajan launched Woodstock Dog Training School, a premier institution in dog training in the year 1988 at Chennai, India to cater to needs of dog owners. Woodstock offers obedience training, personal protection, and grooming programs to domestic dogs, and in the last 15 years Woodstock has successfully trained over 3000 dogs of various breeds. In the year 1992 a new division was added to train dogs for Industrial Security. Lucas TVS Ltd., a leading industrial house in Chennai was quick to capitalize on this opportunity and Woodstock trained a team of 10 dogs and handlers and on their recommendation they set up the dog squad at TI Cycles Ltd., Chennai and Tube Products Ltd., Chennai. In the year 1994 Woodstock set up the dog squad for Lucas TVS Ltd., Sriperumbadur unit. These projects established Woodstock as a premier organization specializing in industrial security. As the next stage Woodstock went into providing dog security with their trained dogs and handlers. Today security dogs from Woodstock are working in many industries in the State of Tamilnadu . This has grown into one of the main divisions of the company and in the last 12 years they have trained more than 500 dogs and handlers for security work. Committed to the cause of dog training Woodstock extended their services to their customers by offering dog-grooming services at customers' doorstep. The "Woodstock Groomobile" was welcomed by many busy dog lover's and has since been a runaway success in the city of Chennai . At every session, trained grooming specialists will bathe, brush and detick the dog, clean ears and eyes and clip toenails if required. They also extend a wide range of services to keep your dog clean, odor free and healthy. In the year 2003 Woodstock went global by opening a branch at Chicago , USA which is offering services similar to those in Chennai. This move has given Woodstock the global reach required to provide services to wider strata of the dog lover's community. At Woodstock we have always enjoyed working with dogs and over the years it has given us immense pleasure and satisfaction to train dogs for various purposes.